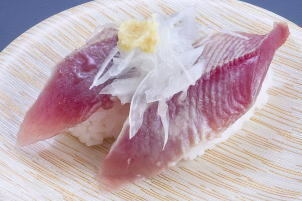 Katsuo no Tataki Nigiri Zushi ('鰹 [カツオ, かつお]のたたき握り寿司', is classified into sushi), is known as Seared Bonito Nigiri Sushi in English, and 炙烤鲣鱼刺身 握寿司 (Zhì kǎo jiān yú cìshēn wò shòusī) in Chinese. It is the washoku. Seared Skipjack Tuna (Arctic Bonito, Mushmouth, Oceanic Bonito, Striped Tuna) Sushi. 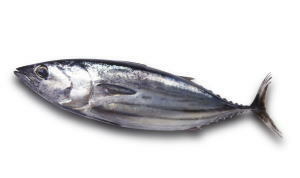 Katsuo no Tataki Nigiri Zushi is a hand-formed sushi that set seared bonito on a formed sushi rice. We can eat this dish at sushi restaurants in Japan.